With its unique, versatile design, the Hand-E-Blok can be used with post, wheel and plate tongue jacks, meeting all of your trailer needs. Use this new, low cost solution to keep your travel investment safe and secure. The Hand-E-Blok has been designed to handle loads up to 15,000 pounds. Because it is made of 100% recycled plastic, it helps reduce corrosion on your jack, at the same time protecting the environment. Reducing jack travel by 6 inches, it also saves you valuable time and energy. With its unique, versatile design, the Hand-E-Blok can be used with post, wheel and plate tongue jacks, meeting all of your trailer needs. 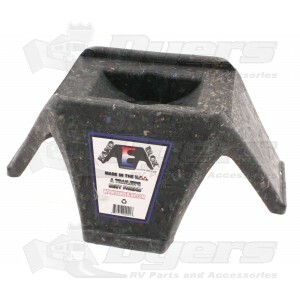 Top foot pad area is 8-1/2" x 4-3/4"
Will fit a post up to 2-3/4"
After using the cone or wood or wheel and having the trailer move with every possible configuration I finally found this excellent jack stand! This is the safest stand out there in my opinion. I no longer worry, at all, that when unhitching my trainer tongue will topple off the stand and swing out and then fall to the ground which happened TWICE with the cone. Fantastic product!